The 91st running of the Pikes Peak International Hill Climb is in the books, and while much of the media attention focused on Sebastien Loeb demolishing the outright course record, setting the first eight-minute lap with a 8:13.878 — over 90 seconds faster than the previous lap record —in his Peugeot 208 T16, history was made in the motorcycle divisions as well. Below are the times for all the motorcycle competitors in this year’s event. 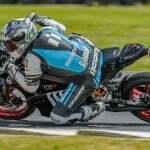 As expected, Carlin Dunne aboard the Lightning electric superbike, took top honors among all motorcycle competitors, marking the first time an electric motorcycle has done so. However, Dunne’s time of 10:00.07, wasn’t enough to break his motorcycle lap record of 9:52.819 set last year on a Ducati Multistrada. He sighted grip issues as the cause for the slower run. 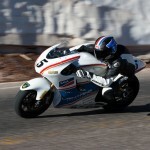 In the Pikes Peak 1205 division, Bruno Langlois, aboard a Ducati Multistrada, set a 10:21.3 to win the class and take second overall to Dunne. 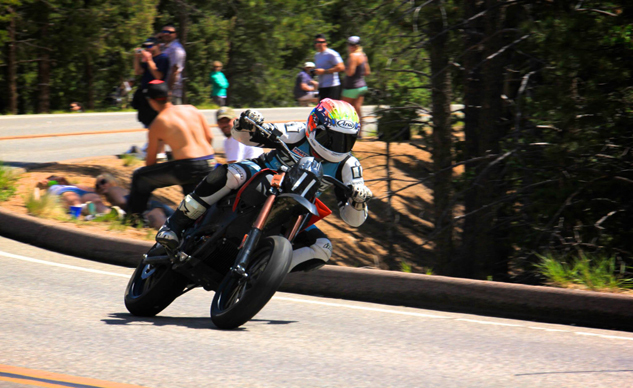 AMA regular, and first time Pikes Peak competitor, Jake Holden, took third overall on a custom Kawasaki ZRX1200 — the ZRX1224RR — built by James Compton, owner of SBK Factory, who also raced an identical ZRX and finished sixth overall. 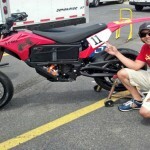 Fellow Pikes Peak rookie, and American Honda test rider, Jeff Tigert, won the Pikes Peak 450 division aboard a 2013 Honda CRF450 and established a new class record of 10:32.964, while Codie Vasholtz set a Pikes Peak 250 record with a time of 11:24.792 on his 1996 Kawasaki KX 250. 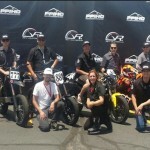 In case you haven’t read our previous updates, Motorcycle.com also competed at this year’s Pikes Peak International Hill Climb, with yours truly behind the controls of a 2013 Zero FX in the all-new Exhibition Powersports-Z class, the first motorcycle division dedicated solely to Zero motorcycles. 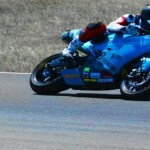 I finished third in class, with a 12:24.1 despite breaking my foot during Friday practice and not being able to walk. 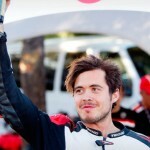 Jeff Clark won the division, putting the hammer down to record a 12:01.0. Stay tuned for my full report on the historic 91st running of the Pikes Peak International Hill Climb in the weeks to come.